Ehrman was horribly exposed in his debate with William Lane Craig a decade ago, so much so that he only just released the video of the encounter this year. He is an irrational thinker when it comes to christianity – he apostatized because of the problem of evil, not because of the scriptures. His inability to reason logically was his undoing in his debate with Craig. This is why he comes up with these conspiracy theories about biblical corruption. An objective view would have to acknowledge that notions of “corruption” are sensationalist and make no logical sense. Again, a reasonable person would ask, why didn’t they insert the father, son, and HS every few verses or so? Or at the end of every book or epistle? Or have jesus saying father, son, and HS throughout the gospels? Try to think, guys. WHoever allegedly “corrupted” the bible was either inept, or notions of corruption are exaggerated. The book has received rave academic reviews from specialist journals and experts in the field. As far as I can see they are all Christian. Your black propaganda impresses no one Joel. Keep your head shoved firmly in the sand. You should read the book. I did. But you will not: always running from the truth. How do you know I haven’t read the book? My objections remain – why wasn’t this alleged corruption more pronounced and widespread? Why isn’t the trinity inserted at every opportunity to make the point? OK have you read the book? Your ignorant and unscholarly comments suggest to me you have never touched a copy. You look like a fool. You guys are still avoiding the point. The claim is that the bible was corrupted, yet when we look at the actual text, we don’t see any dramatic changes that could be said to have fully cemented christian doctrines. My question is legitimate – you are merely appealing to authority without examining the logic underlying the claim. If these scribes or early christians were so invested in corrupting the NT, why didn’t they insert the trinitarian formula more regularly into the text? Why don;t they change the gospels themselves so that the athanasian creed was present in the text? When you think and apply logical reasoning to Ehrman’s emotional irrational sensationalism, you will reach the same conclusions as I have: the claim of textual corruption is exaggerated, but also unlikely since any conscious attempt to change the text should have included more explicit references to the trinitarian formula. Joel: you have not answered my question: have you actually read the book or not? These academic reviews of the book by people who have read the book and know what they are talking about show you are talking crap. As usual. Brother, that is not actually the claim of the book. I, like most people, assumed I knew what the book was about from reading the cover. However, Ehrman typically uses sensationalist titles and this is a case in point. I have read the book and the thesis is: the context of early Christianity was that some people were denying the humanity of Jesus and only believed he was divine; and others were denying the divinity of Jesus and only believed he was human. 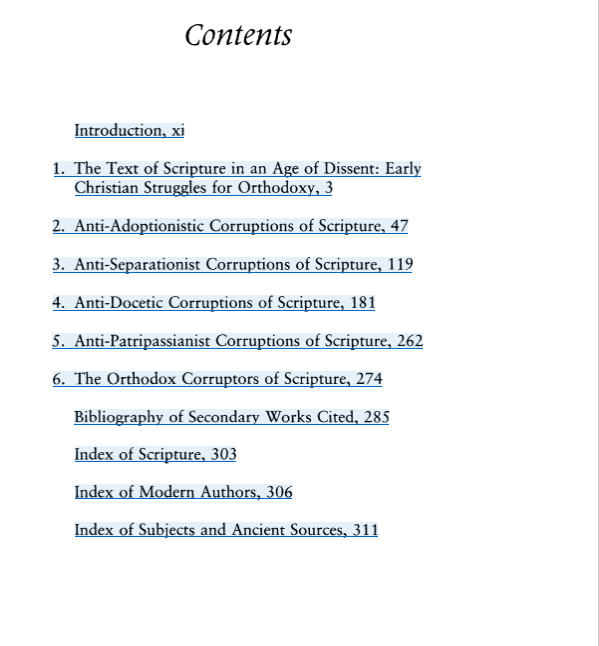 Ehrman seeks to demonstrate that in a few instances orthodox scribes strengthened the emphasis of verses that taught the humanity of Jesus, which were being denied by some, and strengthened the emphasis of those which taught the divinity of Jesus, which were being denied by some. They did this because the scriptures taught both the divinity and humanity of Jesus. He does not say the message of NT has been changed. His thesis is certainly an interesting idea but as far as I know has not been accepted by the academy because there is not enough evidence to establish. Samuel, I seriously doubt you have read the book in question. Yet just above your comment I had already posted reviews by academic specialists praising the book highly. He demonstrates abundantly the deliberate corruption of numerous NT manuscripts by Christian scribes. This fact is not controversial and well known in scholarly circles. Evangelical ministers of course will find it very disturbing. > Samuel, I seriously doubt you have read the book in question. You are seriously wrong. I have read the book and this is his thesis. Read it yourself. In that case you have a very poor grasp of its contents. I suspect your conservative evangelical filters obscured the content of the book. But no matter. The experts (mostly Christian it seems) appreciated the book very much. As did I. My objection was directed at Paul – I have read the book and I know that Ehrman likes sensationalism since it sells books. It is the sensationalism that muslim apologists latch on to – which is why I ask the question of if the bible was so easily and casually corrupted, why didn’t the men who corrupted it insert the trinitarian formula everywhere? Also, I’m a fan – your debates with muslims are inspiring and informative. You’ve never lost! I don’t think you have read the book. I accuse you of being a liar. Because as brother Atlas already showed you, the trinity didn’t spring up over night. It developed over centuries. When they did try to insert the trinity into the text, they had to do it stealthily. It wouldn’t make sense to just insert the formula everywhere because it would be too obvious. So, they tried to insert it in certain places, such as the ending of Matthew or the 1 John, where it could be stealthily and quietly inserted without too many people noticing. Finally, someone tried to answer my question. Your answer is silly, though. Christian religious authorities had full and complete control over the text of the bible for centuries – most followers of the church could not read, mass was usually given in a language most christians could not understand, and church and state were intertwined. Religious authorities could have done much, much more than “insert” a few odd sentences or words here and there. Your claim just does not make sense. The trinitarian formula could have easily been inserted anywhere and everywhere, and contrary documents could easily have been destroyed – why didn;t they do it? The answer, of course, is that the bible is not corrupted. “I cannot judge individuals”- Paul Williams answer when asked if ISIS are Muslims. “I accuse you of being a liar”- Paul Williams answer to a Christian. The first comment refers to individuals i have never met or spoken to. So I cannot judge them. The second refers to someone who comments on my blog everyday whom I accuse of being a barefaced liar. But brother Paul, he’s a barefaced liar with a degree in Christian-Muslim relations! I know you were referring to Coco initially, but Cerbie also fits the bill. Actually my degree is in theology. My masters thesis was on Islam in se asia. Awww, Cerbie is still upset. There, there…It’s okay. Everyone now knows that you are full of crap and have no credibility whatsoever. Hahaha, an Islamophobic troll writing a thesis on Islam in SE Asia! That’s like a neo-Nazi writing a thesis on Jewish history! I’m still waiting for your specific thesis on Islam in SE Asia. It had to be more specific. Still waiting on you to give us your training on nt textual criticism since you’ve said that the ending of Matthew is corrupt. Or on Hebrew linguistics since you keep claiming that Yahweh is a pagan deity. Or on Hebrew exegesis since you’ve repeatedly made claims about interpretation. 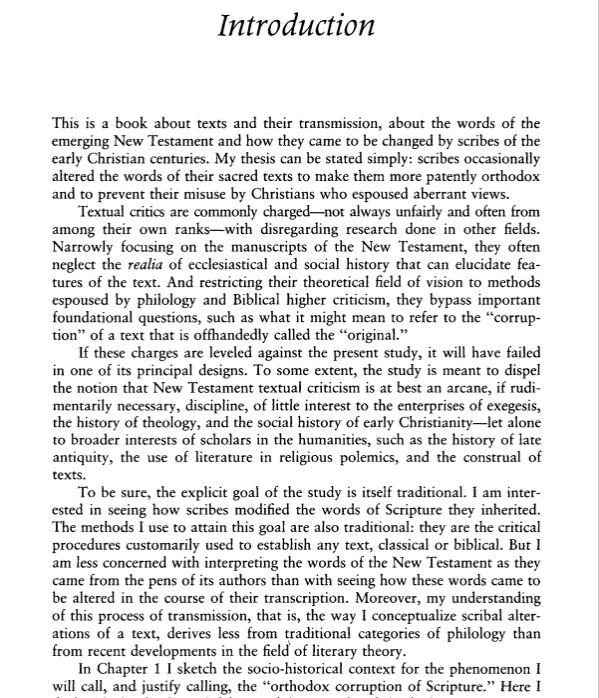 Have you even ever studied hermeneutics? How about Pauline theology? What about apocalyptic theology since you claim to know how to interpret Daniel and Revelation? Don’t be embarrassed little boy. Just fess up. Cause unlike you, I have actually studied those topics. And clearly it embarrasses you to be exposed as a fake. You link to your own “articles” without confessing you’ve just copy pasted something that suits your masjidian bias. Of Islam and knownits history I doubt you’d even have a clue even if I told you. LOL, so the neutered dog still hasn’t learned! I guess you didn’t take my advice, huh? You know, to actually respond to a claim with substantive rebuttals rather than idiotic questions about one’s credentials? Still waiting for more information on your thesis. What about Islam in SE Asia? Paulus, this blog is not about showing off academic credentials, last time you asked my qualifications in hebrew even though I can read and understand hebrew and God knows how many hours I have dedicated my self to study the Bible in hebrew and rabbinical writings to find the truth in it, you sure are an arrogant and silly chap. Why does it matters to the arguments if I tell you that I too posses a university and Master degree from reputable British university, Why does matters if tell you that I also got my traditional Islamic education from religious scholars from Saudi Arabia and Egypt as well as Hebrew training from an orthodox rabbi from Jerusalem? None! Lol, good reply brother Eric! Cerbie sure is pathetic, isn’t he? “The KKK are very much a Protestant group”- Paul Williams. So Paul, you feel free to judge the kkk without meeting them but unwilling to judge ISIS for apparently the exact same reason? You judge the kkk based on their “symbol” but won’t judge ISIS as Muslim based on their symbol or statements of faith. 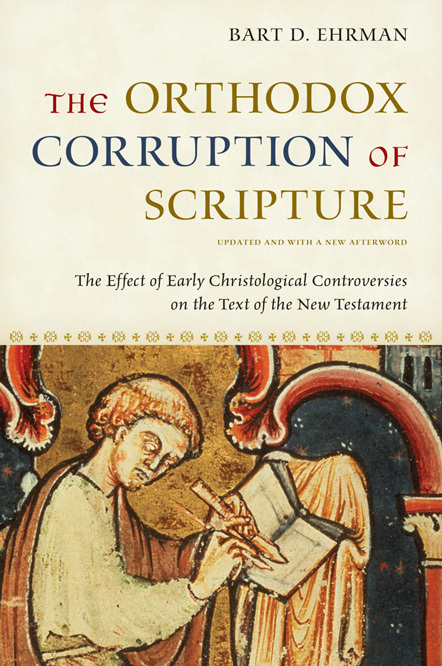 The title of Ehrmann’s book doesn’t really signify anything that Christians should be concerned about as providence did not work by preventing any corruption whatsoever in every copy of the original. There isn’t the same impetus to corrupt the Koran because it has no doctrinal complexity and much of it is derived from other sources anyway. No consternation on my part. LOL, thank you for admitting that “providence” did not prevent the corruption of your book and that the Quran was not corrupted! I don’t think there is one.